We’re living in the age of the entrepreneur. While this is good news for ambitious up-and-comers, an increased level of competition has many companies scrambling to maintain a hold on their target demographic. If you’re selling a quality product or service, you need to show consumers that you’re a quality business — but just how can you communicate all the necessary details about who you are and what you value in a way that is fast and easy to absorb? Through signage, of course! Business signage — from outdoor signs and supplemental promotional signs to car decals and stickers — perform a number of roles. Let’s take a look at the three main ways business signs can publicize, get the word out about you, and improve brand awareness. First impressions are the crux of business signage. Studies have revealed you only have about seven seconds before first impressions are formed and locked in. This means your sign must convey any important and relevant information it contains to consumers in the first seven seconds or they’ll lose interest and move on. Try to focus on the following three components to make sure the correct message regarding your brand is coming across. Quality: If your sign is of poor quality, potential customers are going to assume your products or services are, too! Think of your signage as an investment in your business: if you craft promotional signs out of high-quality materials — even if they’re just car stickers or car wraps — people will see that you’re a quality business. Personality: This applies to both your logo and the fonts you use. You want to be able to convey to your potential customers exactly who you are, visually. It sounds like a trivial factor, but you must remember that you only have those seven crucial seconds; choosing both carefully will guarantee that you’re effectively communicating who you are. Offer: A sign can be is useless if it doesn’t tell someone why they should choose your company over others selling the same or similar products. Include a tagline or call to action encouraging customers to check out your website or brick-and-mortar location, and give them some incentive in the form of a sale or promotion. If you’re looking to improve brand awareness, you need to start with a fantastic first impression. It’s natural to think that you only need signs at your business location or on your vehicle if you do not have a storefront. While this will gain you new customers, you can cast a broader net. Instead of focusing on one kind of sign exclusively, do your best to branch out: make yard signs that you can leave at a customer’s location indicating that you did work at that location; use vertical banners to promote specials or to draw attention to your business; if you use contractors to provide work for your customers provide magnetic signs for their vehicles so they are branded with your company name; if your customers love your business then make decals and hand them out as freebies so they can share their love! After all, you can only improve brand awareness if people are aware of your brand in the first place! Unfortunately, it’s human nature to become complacent when we achieve success. If your business is booming due to your signs, you may think they’ll be effective for the next decade, or you’ll simply forget about their importance altogether. Resist this urge! Signs only work to improve brand awareness if they’re effectively communicating with consumers, and consumers change with time; this means that your signs need to change with time as well. If you’re committed to keeping your signage content fresh and updated, your customers will continue to view your business — and your brand — as a relevant one. At the end of the day, taking the time and effort to improve brand awareness can keep your business afloat in a sea of competition. Don’t neglect your company’s image; do your best to convey your business’s personality and character through signage and customers will be flocking to your door. Accurate Signs provides professional vehicle wraps, promotional signs, car decals, and vinyl vehicle lettering so that you can better advertise your business anywhere and everywhere you go! 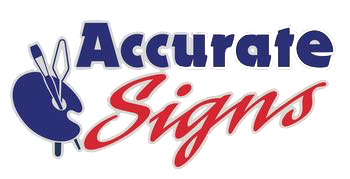 To learn more, contact Accurate Signs today. We look forward to hearing from you!